Tennis Clinics are open to campers who will be entering 1st grade or older and are run from 4:00-6:00 Monday-Thursday. See Dismissal form for full schedule. 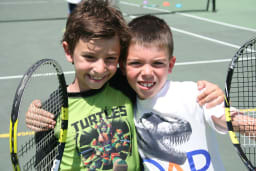 During the Tennis Clinics, campers are divided by age and/or ability to form two groups which allow maximum individual attention to each camper. While in these small groups, campers have the opportunity to work directly with the tennis instructor perfecting skills or adding new skills to their repertoire. These groups alternate tennis time on the courts with an extra swim period in the pools, making for a terrific afternoon combo. Campers can sign up for tennis clinics through the Parent Dashboard using the Dismissal form-- by the week or by the day at the rate of $38/day. Please call the camp office for occasional use sign up.